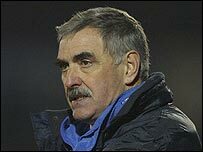 Wycombe have parted company with manager John Gorman after 18 months in charge at the Causeway Stadium. In a statement on their website, the club said: "We have reluctantly agreed to release John from his position. "The Board believes John needs a great deal more time and professional help to deal with the tragic loss of his wife. "In the meantime we need to continue with the operation of the club and a financial package has been agreed with John which he is satisfied with." Gorman was given time away from the club after the death of his wife Myra in February following a battle against cancer and although he returned in March, he was sent home on compassionate leave in April. At the time the club had said that Gorman hoped to resume his full-time role before the start of next season. The death of Gorman's wife was the second tragedy to hit the club as it came a month after midfielder Mark Philo was killed in a car accident. On the field, the club missed out on promotion after bowing out to Cheltenham in the play-off semi-finals despite a superb start to the season which saw them unbeaten in their first 21 games. They led the table in mid-February but only won four of their final 13 matches to end up in the play-off zone.